WordPress is a popular content-publication software that can do everything from run a simple four-page web site to an eCommerce shop. Even our knowledgebase is run with WordPress, a few plugins, and a theme. If you would like to install WordPress in a folder within the domain, click the dropdown and select Edit Subdir. Select or create the folder. WordPress will install. A verification email will be sent to the administrative address on the account confirming your login and password. The destination must be empty. If there are files present, remove them first via Files > File Manager. 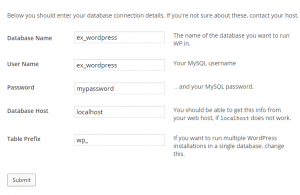 WordPress and other web app installation options in apnscp. WordPress takes about 5 minutes to install and 3 minutes to configure. Maybe more, maybe less depending upon how easily you get sidetracked. There are 3 main components to setting WordPress up: (1) configuring a database to store information, (2) uploading the files, (3) changing permissions to allow write access. For speed, we recommend using a FTP client or terminal to setup WordPress. This will cover setting up WordPress using the control panel exclusively. There are three methods of getting WordPress on your account ordered from fastest to slowest and additionally sorted from most to least difficult. Choose whichever works best for you! This is available only for accounts with terminal access. FTP is much quicker to upload files. If you’re comfortable with using a FTP client, use a FTP client to save some time (and a considerable number of steps). Summary of actions to do in File Manager: remove index.html, enter URL, click button. 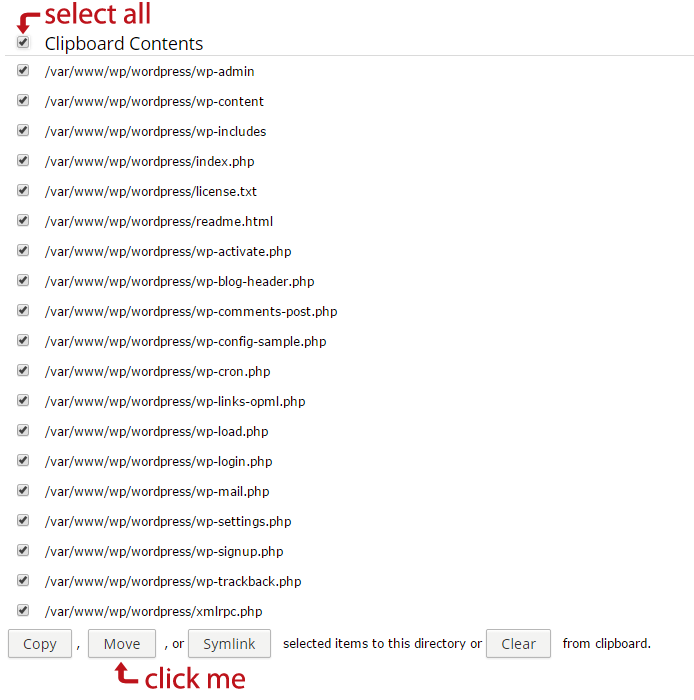 WordPress bulk selection files in the control panel. These files will be moved down a directory. 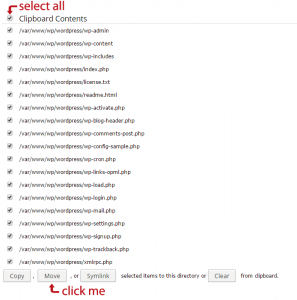 Managing WordPress clipboard contents to move up a directory. Now that WordPress is up and running, we need to setup a default configuration. 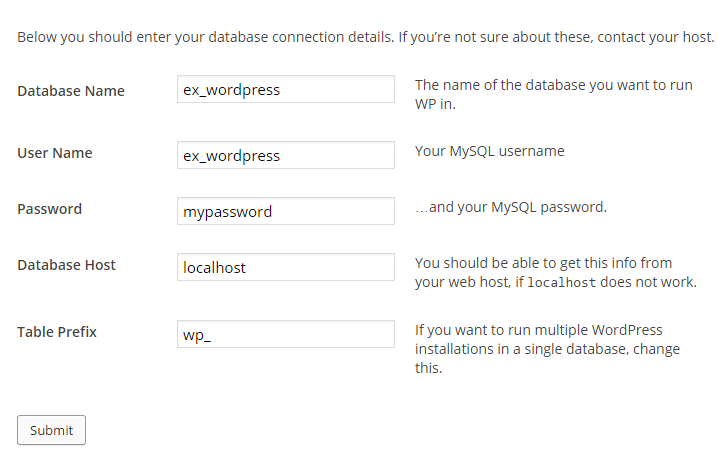 WordPress database settings following this walkthrough. WordPress needs to store this configuration file inside its application directory. With security restrictions in place (it’s for your own good!) this file must be uploaded separately either through the terminal, FTP, or control panel. Uploading wp-config.php during installation in the File Manager. Choose a strong password. Accounts are hacked either by outdated WordPress installs or easy password. Stay vigilant and keep your account secure. Done! Now login to your WordPress dashboard and have fun. Write-access will allow WordPress to store files in certain locations, while preventing access to modify/delete/create files elsewhere. This is a necessary precaution to help keep your account safe. See KB: enabling write-access. By default, we recommend enabling write-access to only wp-content/uploads/. Media files may be uploaded through WordPress and files in these directories go through an extra security measure to serve all files as if they were media files (prevents hackers from uploading malicious PHP files to these locations). This entry was posted in WordPress and tagged blog, guide, php, wordpress.